There are plenty of pre-conceived notions about going green, from the cost of eco-friendly measures, to the lifestyles and political leanings of those who employ them. But according to results from a recently-completed 2018 report, people across political, cultural, and generational spectrums are likely to find it equally easy being green. Among the 3,000 American adults polled for the study, 60 percent consider themselves to be conscious of environmental issues. Broken out by age demographics, a large portion of millennial (58 percent) and Gen Z (57 percent) respondents considered themselves eco-conscious, but baby boomers outpaced both groups, with a full 66 percent saying they considered themselves eco-conscious. 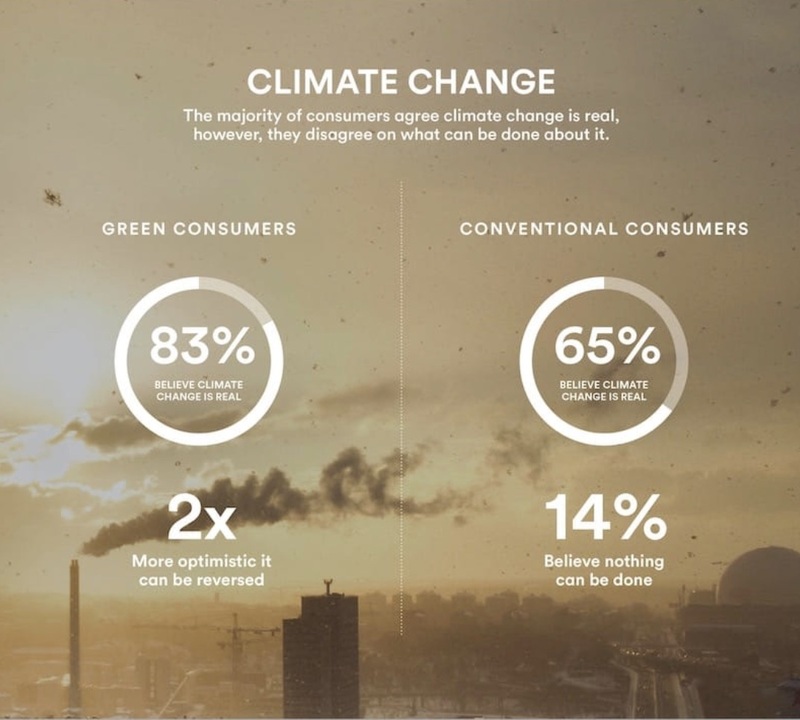 Regardless of age, the study found several touchpoints of common ground between the 60 percent who did consider themselves green, and the 40 percent who considered themselves to be more conventional consumers. Politically, one in four of the eco-conscious respondents voted for Donald Trump in the 2016 election—the same rate as their conventional counterparts. And green consumers were just as likely to identify as Democrat as Republican—28 percent on both sides of the aisle. The bulk of respondents overall (43 percent) identified politically as independents. Even on controversial political issues, both sides were generally in harmony. The majority of both groups (68 percent of green respondents, and 59 percent of conventional respondents) similarly supported the legalization of marijuana. For too long, perceptions of green consumers – the young vegan who cycles to farmers markets – have not aligned with reality. As our report indicates, the bulk of the population with an interest into being eco-conscious, or going green in the future, is far more diverse. While differences certainly abound, the results suggest that the gulf between green and conventional consumers is much narrower than originally believed; it likely has more to do with perception, not practice. Of course, the two groups don’t see eye to eye on everything. There is a considerable gap between the groups’ belief that climate change is real (83 percent of green respondents versus 65 percent of conventional respondents). Green consumers were twice as likely to believe that it could be reversed, as opposed to the 14 percent of conventional respondents who said they felt nothing could be done about the issue. Differences also abound in the perception versus reality of eco-friendly folks. One quarter of conventional respondents viewed green respondents as a group keeping vegan diets, yet just 4 percent of green consumers reported being vegan. In fact, 88 percent of them said meat is a regular part of their diets. What are the barriers to going green? It starts with education. Research found that the more education respondents had, the more likely they were to report being eco-conscious. Learning more about our planet, and our responsibility to be environmental stewards, is a proven way to inspire behavioral change. 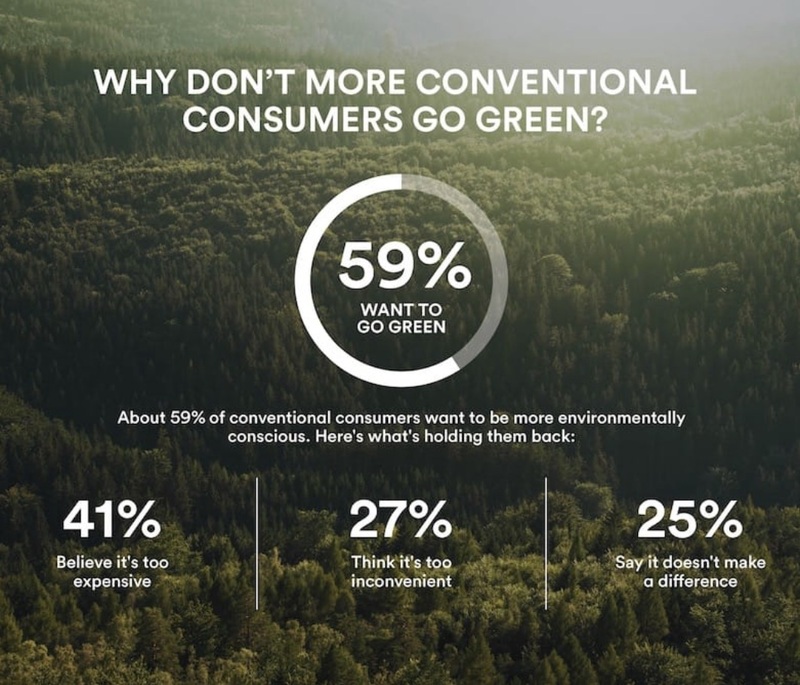 While the majority of conventional consumers (59 percent) have a desire to become more eco-conscious, they see a number of roadblocks getting in their way. Among these barriers was a belief that going green would be inconvenient; many conventional respondents believed their green counterparts engaged in significant lifestyle changes, like composting or driving an electric vehicle. The data debunks this myth. 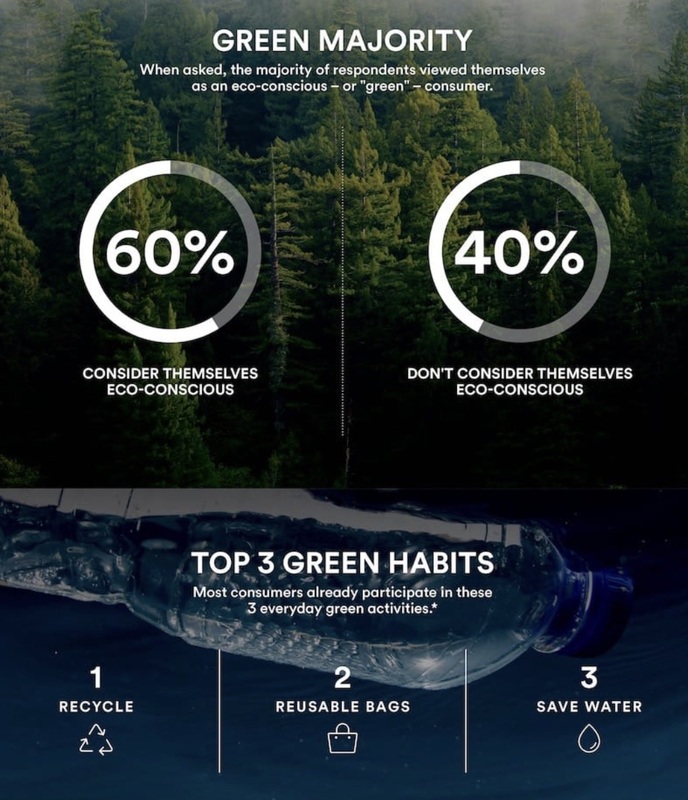 Out of a list of 25 activities that might contribute to a green lifestyle, the top three among all respondents were recycling, using reusable shopping bags, and conserving water. In fact, people who consider themselves green and those who self-identify as a conventional consumer, exhibit many of the same behaviors. The largest single reason conventional respondents gave (at 41 percent) was that going green would be too expensive. This is an outdated perception. Across the board, energy-efficiency products such as electric vehicles and solar panels are becoming more affordable and easier to adopt. The price of solar energy has plummeted 86 percent since 2009; one megawatt of solar power now costs just $50 to produce at utility scale. Going green also delivers a tremendous return on investment. For example, smart thermostats can save the average customer up to $145 per year, paying for themselves in less than two years. More than half of survey respondents have already installed solar panels, or were likely to do so in the next five years. Notably, younger people are leading this charge. Among all respondents, solar seemed to serve as a kind of gateway to going green. Not only is installing solar panels becoming much more of a mainstream move, it also serves as an introduction for those who want to be more eco-friendly for ideological reasons, as well as those who are primarily focused on their finances. It’s a middle ground for both camps that makes a positive impact on both the environment, and their wallets. David Bywater is CEO of Vivint Solar, a full-service residential solar provider. Vivint conducted a nationwide survey that polled more than 3,000 Americans, the results of which can be found in its 2018 Environmental Consumer Report.